1 A None No Power Seat 1 A is a standard Business Class seat located at a bulkhead. The proximity to the lavatory and galleys might be bothersome. 1 D None No Power Seat 1 D is a standard Business Class seat located at a bulkhead. The proximity to the lavatory and galleys might be bothersome. 1 G None No Power Seat 1 G is a standard Business Class seat located at a bulkhead. The proximity to the lavatory and galleys might be bothersome. 1 K None No Power Seat 1 K is a standard Business Class seat located at a bulkhead. The proximity to the lavatory and galleys might be bothersome. 10 A None No Power Seat 10 A is a standard Premium Economy seat located at a bulkhead and might have additional legroom. There is no floor storage for use during takeoff and landing. The tray table and the inflight entertainment monitor are in the armrest making the armrest immovable, therefore, slightly reducing seat width. This is a bassinet location, therefore, a passenger traveling with an infant might be seated here. 10 B None No Power Seat 10 B is a standard Premium Economy seat located at a bulkhead and might have additional legroom. There is no floor storage for use during takeoff and landing. The tray table and the inflight entertainment monitor are in the armrest making the armrest immovable, therefore, slightly reducing seat width. This is a bassinet location, therefore, a passenger traveling with an infant might be seated here. 10 C None No Power Seat 10 C is a standard Premium Economy seat located at a bulkhead and might have additional legroom. There is no floor storage for use during takeoff and landing. The tray table and the inflight entertainment monitor are in the armrest making the armrest immovable, therefore, slightly reducing seat width. This is a bassinet location, therefore, a passenger traveling with an infant might be seated here. 10 D None No Power Seat 10 D is a standard Premium Economy seat located at a bulkhead and might have additional legroom. There is no floor storage for use during takeoff and landing. The tray table and the inflight entertainment monitor are in the armrest making the armrest immovable, therefore, slightly reducing seat width. This is a bassinet location, therefore, a passenger traveling with an infant might be seated here. 10 E None No Power Seat 10 E is a standard Premium Economy seat located at a bulkhead and might have additional legroom. There is no floor storage for use during takeoff and landing. The tray table and the inflight entertainment monitor are in the armrest making the armrest immovable, therefore, slightly reducing seat width. This is a bassinet location, therefore, a passenger traveling with an infant might be seated here. 10 F None No Power Seat 10 F is a standard Premium Economy seat located at a bulkhead and might have additional legroom. There is no floor storage for use during takeoff and landing. The tray table and the inflight entertainment monitor are in the armrest making the armrest immovable, therefore, slightly reducing seat width. This is a bassinet location, therefore, a passenger traveling with an infant might be seated here. 10 G None No Power Seat 10 G is a standard Premium Economy seat located at a bulkhead and might have additional legroom. There is no floor storage for use during takeoff and landing. The tray table and the inflight entertainment monitor are in the armrest making the armrest immovable, therefore, slightly reducing seat width. This is a bassinet location, therefore, a passenger traveling with an infant might be seated here. 10 H None No Power Seat 10 H is a standard Premium Economy seat located at a bulkhead and might have additional legroom. There is no floor storage for use during takeoff and landing. The tray table and the inflight entertainment monitor are in the armrest making the armrest immovable, therefore, slightly reducing seat width. This is a bassinet location, therefore, a passenger traveling with an infant might be seated here. 10 K None No Power Seat 10 K is a standard Premium Economy seat located at a bulkhead and might have additional legroom. There is no floor storage for use during takeoff and landing. The tray table and the inflight entertainment monitor are in the armrest making the armrest immovable, therefore, slightly reducing seat width. This is a bassinet location, therefore, a passenger traveling with an infant might be seated here. 11 C None No Power Seat 11 C is a standard Premium Economy seat. 11 D None No Power Seat 11 D is a standard Premium Economy seat. 12 C None No Power Seat 12 C is a standard Premium Economy seat. 12 D None No Power Seat 12 D is a standard Premium Economy seat. 14 B None No Power Seat 14 B is a standard Premium Economy seat. 14 F None No Power Seat 14 F is a standard Premium Economy seat. 14 K None No Power Seat 14 K is a standard Premium Economy seat. 16 A None No Power Seat 16 A is a standard Economy Class seat located at a bulkhead with additional legroom. There is no floor storage for use during takeoff and landing. The tray table and inflight entertainment monitor are in the armrest making the armrest immovable, therefore, slightly reducing seat width. This is a bassinet location, therefore, a passenger with an infant might be located here. 16 B None No Power Seat 16 B is a standard Economy Class seat located at a bulkhead with additional legroom. There is no floor storage for use during takeoff and landing. The tray table and inflight entertainment monitor are in the armrest making the armrest immovable, therefore, slightly reducing seat width. This is a bassinet location, therefore, a passenger with an infant might be located here. 16 C None No Power Seat 16 C is a standard Economy Class seat located at a bulkhead with additional legroom. There is no floor storage for use during takeoff and landing. The tray table and inflight entertainment monitor are in the armrest making the armrest immovable, therefore, slightly reducing seat width. This is a bassinet location, therefore, a passenger with an infant might be located here. 16 D None No Power Seat 16 D is a standard Economy Class seat located at a bulkhead with additional legroom. There is no floor storage for use during takeoff and landing. The tray table and inflight entertainment monitor are in the armrest making the armrest immovable, therefore, slightly reducing seat width. This is a bassinet location, therefore, a passenger with an infant might be located here. 16 E None No Power Seat 16 E is a standard Economy Class seat located at a bulkhead with additional legroom. There is no floor storage for use during takeoff and landing. The tray table and inflight entertainment monitor are in the armrest making the armrest immovable, therefore, slightly reducing seat width. This is a bassinet location, therefore, a passenger with an infant might be located here. 16 F None No Power Seat 16 F is a standard Economy Class seat located at a bulkhead with additional legroom. There is no floor storage for use during takeoff and landing. The tray table and inflight entertainment monitor are in the armrest making the armrest immovable, therefore, slightly reducing seat width. This is a bassinet location, therefore, a passenger with an infant might be located here. 16 G None No Power Seat 16 G is a standard Economy Class seat located at a bulkhead with additional legroom. There is no floor storage for use during takeoff and landing. The tray table and inflight entertainment monitor are in the armrest making the armrest immovable, therefore, slightly reducing seat width. This is a bassinet location, therefore, a passenger with an infant might be located here. 16 H None No Power Seat 16 H is a standard Economy Class seat located at a bulkhead with additional legroom. There is no floor storage for use during takeoff and landing. The tray table and inflight entertainment monitor are in the armrest making the armrest immovable, therefore, slightly reducing seat width. This is a bassinet location, therefore, a passenger with an infant might be located here. 16 K None No Power Seat 16 K is a standard Economy Class seat located at a bulkhead with additional legroom. There is no floor storage for use during takeoff and landing. The tray table and inflight entertainment monitor are in the armrest making the armrest immovable, therefore, slightly reducing seat width. This is a bassinet location, therefore, a passenger with an infant might be located here. 2 D None No Power Seat 2 D is a standard Business Class seat. This seat is ideal if traveling with a companion. 2 G None No Power Seat 2 G is a standard Business Class seat. This seat is ideal if traveling with a companion. 26 A None No Power Seat 26 A is a standard Economy Class seat located in the last row of the section. Recline might be limited. The proximity to the lavatories might be bothersome. 26 B None No Power Seat 26 B is a standard Economy Class seat located in the last row of the section. Recline might be limited. The proximity to the lavatories might be bothersome. 26 C None No Power Seat 26 C is a standard Economy Class seat located in the last row of the section. Recline might be limited. The proximity to the lavatories might be bothersome. 26 D None No Power Seat 26 D is a standard Economy Class seat located in the last row of the section. Recline might be limited. The proximity to the lavatories might be bothersome. 26 E None No Power Seat 26 E is a standard Economy Class seat located in the last row of the section. Recline might be limited. The proximity to the lavatories might be bothersome. 26 F None No Power Seat 26 F is a standard Economy Class seat located in the last row of the section. Recline might be limited. The proximity to the lavatories might be bothersome. 26 G None No Power Seat 26 G is a standard Economy Class seat located in the last row of the section. Recline might be limited. The proximity to the lavatories might be bothersome. 26 H None No Power Seat 26 H is a standard Economy Class seat located in the last row of the section. Recline might be limited. The proximity to the lavatories might be bothersome. 26 K None No Power Seat 26 K is a standard Economy Class seat located in the last row of the section. Recline might be limited. The proximity to the lavatories might be bothersome. 27 D None No Power Seat 27 D is a standard Economy Class seat located at a bulkhead which might have additional legroom. The tray table and inflight entertainment monitor are in the armrest making the armrest immovable, therefore, slightly reducing seat width. The proximity to the lavatories might be bothersome. This is a bassinet location, therefore, a passenger with an infant might be seated here. 27 E None No Power Seat 27 E is a standard Economy Class seat located at a bulkhead which might have additional legroom. The tray table and inflight entertainment monitor are in the armrest making the armrest immovable, therefore, slightly reducing seat width. The proximity to the lavatories might be bothersome. This is a bassinet location, therefore, a passenger with an infant might be seated here. 27 F None No Power Seat 27 F is a standard Economy Class seat located at a bulkhead which might have additional legroom. The tray table and inflight entertainment monitor are in the armrest making the armrest immovable, therefore, slightly reducing seat width. The proximity to the lavatories might be bothersome. This is a bassinet location, therefore, a passenger with an infant might be seated here. 28 A None No Power Seat 28 A is a standard Economy Class seat located at an exit row and has extra legroom. There is no floor storage for use during takeoff and landing. The tray table and inflight entertainment monitor are in the armrest making the armrest immovable, therefore, slightly reducing seat width. The proximity to the lavatories might be bothersome. 28 B None No Power Seat 28 B is a standard Economy Class seat located at an exit row and has extra legroom. There is no floor storage for use during takeoff and landing. The tray table and inflight entertainment monitor are in the armrest making the armrest immovable, therefore, slightly reducing seat width. The proximity to the lavatories might be bothersome. 28 C None No Power Seat 28 C is a standard Economy Class seat located at an exit row and has extra legroom. There is no floor storage for use during takeoff and landing. The tray table and inflight entertainment monitor are in the armrest making the armrest immovable, therefore, slightly reducing seat width. The proximity to the lavatories might be bothersome. 28 G None No Power Seat 28 G is a standard Economy Class seat located at an exit row and has extra legroom. There is no floor storage for use during takeoff and landing. The tray table and inflight entertainment monitor are in the armrest making the armrest immovable, therefore, slightly reducing seat width. The proximity to the lavatories might be bothersome. 28 H None No Power Seat 28 H is a standard Economy Class seat located at an exit row and has extra legroom. There is no floor storage for use during takeoff and landing. The tray table and inflight entertainment monitor are in the armrest making the armrest immovable, therefore, slightly reducing seat width. The proximity to the lavatories might be bothersome. 28 K None No Power Seat 28 K is a standard Economy Class seat located at an exit row and has extra legroom. There is no floor storage for use during takeoff and landing. The tray table and inflight entertainment monitor are in the armrest making the armrest immovable, therefore, slightly reducing seat width. The proximity to the lavatories might be bothersome. 3 D None No Power Seat 3 D is a standard Business Class seat. This seat is ideal if traveling with a companion. 3 G None No Power Seat 3 G is a standard Business Class seat. This seat is ideal if traveling with a companion. 4 D None No Power Seat 4 D is a standard Business Class seat. This seat is ideal if traveling with a companion. 4 G None No Power Seat 4 G is a standard Business Class seat. This seat is ideal if traveling with a companion. 41 A None No Power Seat 41 A is a standard Economy Class seat. This seat is in the last row of the aircraft. Recline might be limited. The proximity to the lavatory and galleys might be bothersome. 41 B None No Power Seat 41 B is a standard Economy Class seat. This seat is in the last row of the aircraft. Recline might be limited. The proximity to the lavatory and galleys might be bothersome. 41 C None No Power Seat 41 C is a standard Economy Class seat. This seat is in the last row of the aircraft. Recline might be limited. The proximity to the lavatory and galleys might be bothersome. 41 D None No Power Seat 41 D is a standard Economy Class seat. The proximity to the lavatory and galley might be bothersome. 41 F None No Power Seat 41 F is a standard Economy Class seat. The proximity to the lavatory and galley might be bothersome. 41 G None No Power Seat 41 G is a standard Economy Class seat. This seat is in the last row of the aircraft. Recline might be limited. The proximity to the lavatory and galleys might be bothersome. 41 H None No Power Seat 41 H is a standard Economy Class seat. This seat is in the last row of the aircraft. Recline might be limited. The proximity to the lavatory and galleys might be bothersome. 41 K None No Power Seat 41 K is a standard Economy Class seat. This seat is in the last row of the aircraft. Recline might be limited. The proximity to the lavatory and galleys might be bothersome. 42 D None No Power Seat 42 D is a standard Economy Class seat. This seat is in the last row of the aircraft. Recline might be limited. The proximity to the lavatory and galleys might be bothersome. 42 E None No Power Seat 42 E is a standard Economy Class seat. This seat is in the last row of the aircraft. Recline might be limited. The proximity to the lavatory and galleys might be bothersome. 42 F None No Power Seat 42 F is a standard Economy Class seat. This seat is in the last row of the aircraft. Recline might be limited. The proximity to the lavatory and galleys might be bothersome. 5 D None No Power Seat 5 D is a standard Business Class seat. This seat is ideal if traveling with a companion. 5 G None No Power Seat 5 G is a standard Business Class seat. This seat is ideal if traveling with a companion. 6 D None No Power Seat 6 D is a standard Business Class seat. This seat is ideal if traveling with a companion. 6 G None No Power Seat 6 G is a standard Business Class seat. This seat is ideal if traveling with a companion. 7 D None No Power Seat 7 D is a standard Business Class seat. The proximity to the lavatory and galleys might be bothersome. This seat is ideal if traveling with a companion. 7 G None No Power Seat 7 G is a standard Business Class seat. The proximity to the lavatory and galleys might be bothersome. This seat is ideal if traveling with a companion. 8 A None No Power Seat 8 A is a standard Business Class seat. The proximity to the lavatory and galleys might be bothersome. 8 K None No Power Seat 8 K is reserved for pilot rest. 110-volt plug and/or USB power ports are available for use at every seat. Vietnam Airlines is one of the first carriers in Southeast Asia operating the Airbus A350-900. The A350-900 is one of the most technologically advanced passenger aircraft in service. 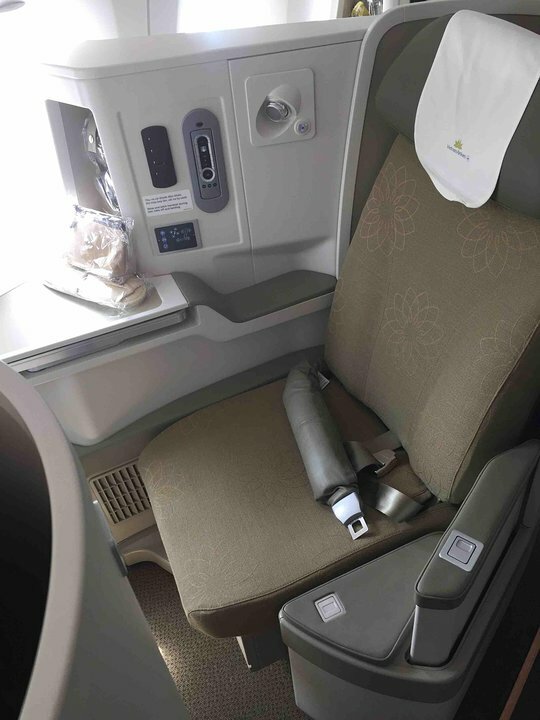 The aircraft features comfortable seating for 305 passengers spread across three classes. Amenities include personal Audio Video On Demand (AVOD), 110v plug or USB power ports at every seat, and access to Wi-Fi. I have flown Vietnam Airlines four times in a 350 in Business in the last half year. They have two different configurations. The "older" planes have the seating as depicted, the newer ones, e.g. 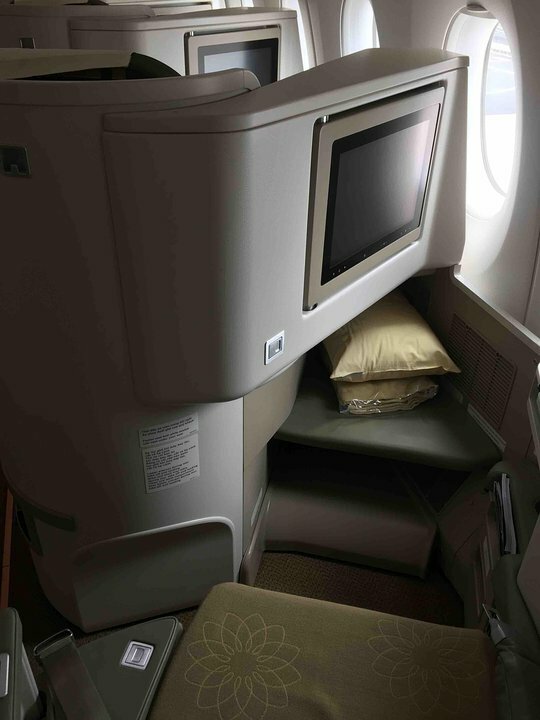 VN-A890 and 892, have the fishbone seating of the B787. A very enjoyable flight with top service! Vietnam Airlines flies 2 versions of A350-900.